Strawberries and cream anything rarely pleases my taste-buds as artificial strawberry tends to be so cloying and artificial vanilla so bland. 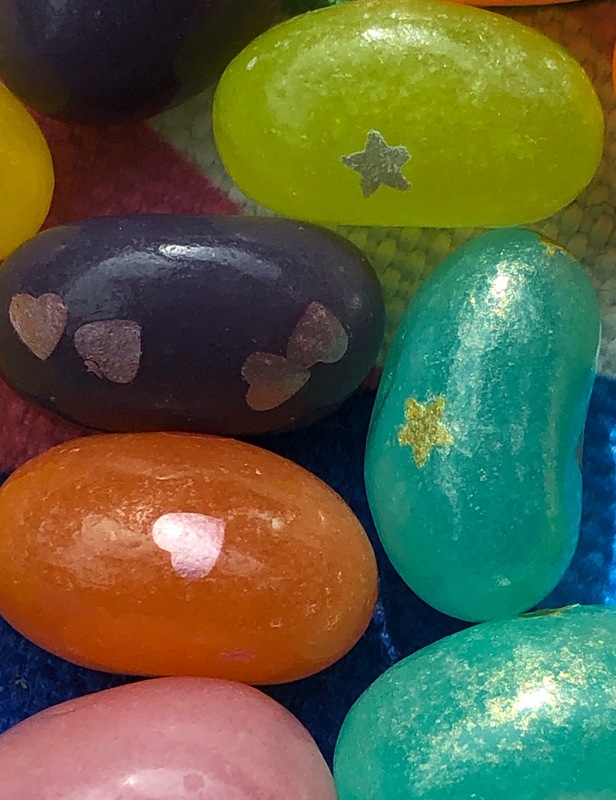 Mike and Ike has done the combination a favor, though. I would classify the strawberry as more of a "pink berry" artificial yet yummy berry-like flavor. The cream tastes more like cream soda to me, and I like it. The combination in no way resembles a dish of strawberries and cream but is pleasant nonetheless. 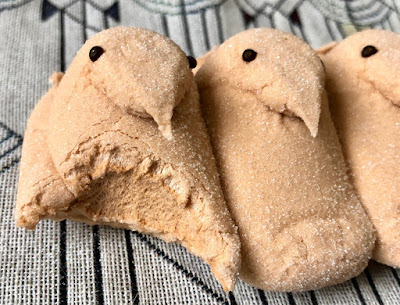 Wishing you all overflowing Easter baskets with all the good sweets! These E Wedel fruit jellies from Poland are so tasty! 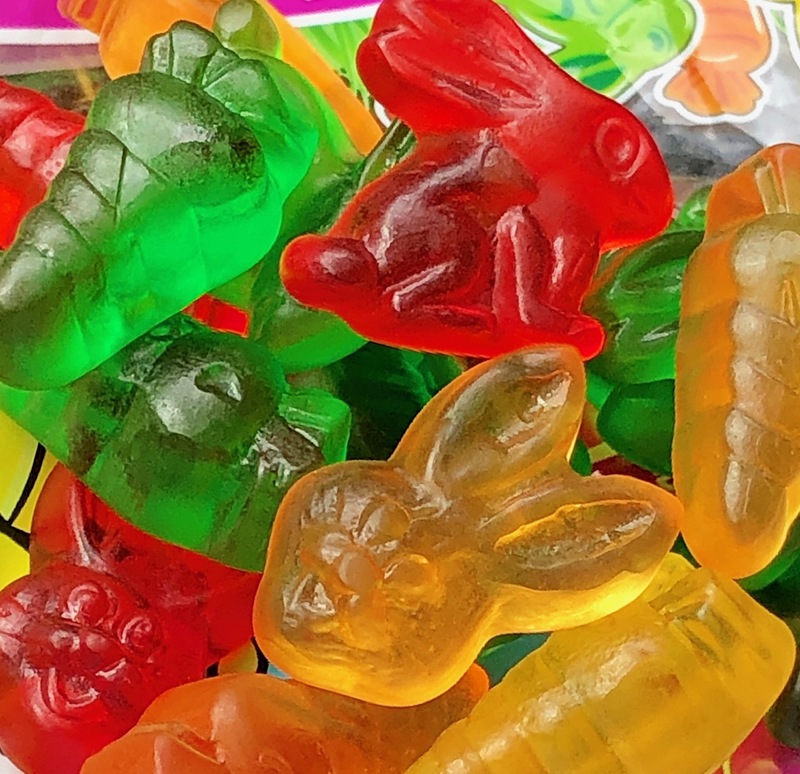 I knew they were awfully cute gummies but didn't have especially high expectations. 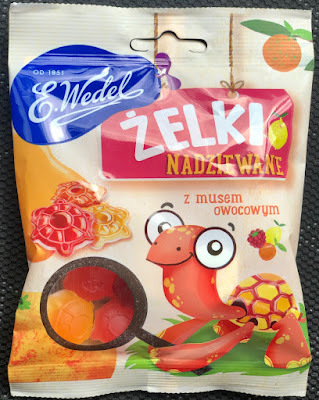 Called Zelki Nadziewane z musem owocowym, this apparently roughly translates to fruit jellies with mousse. 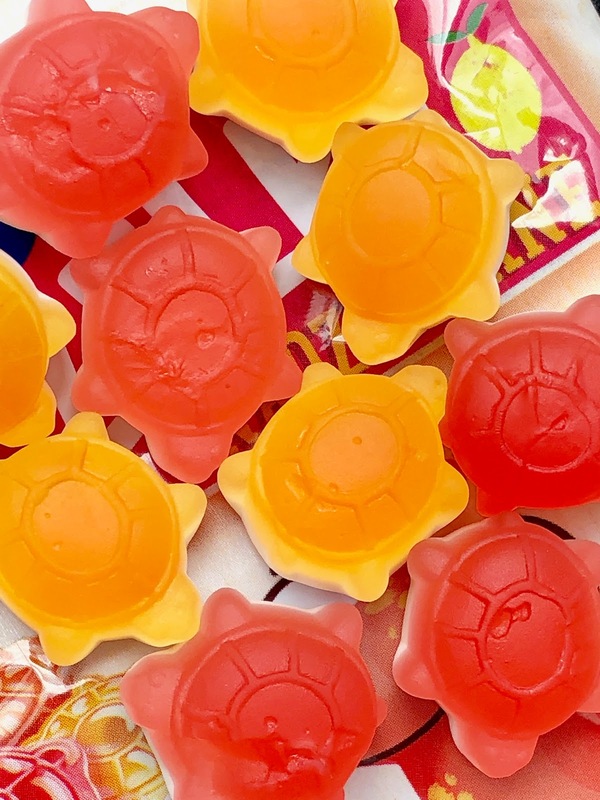 The mousse element constitutes the softer foamy vanilla base to each gummy turtle. The shells are flavored orange, lemon, and raspberry, all sharp good flavors that blend well with the creamy bottom layer. I've never heard of Japanese sweet Momiji Monju, a traditional treat originating from the island of Itsukushima in Hiroshima. 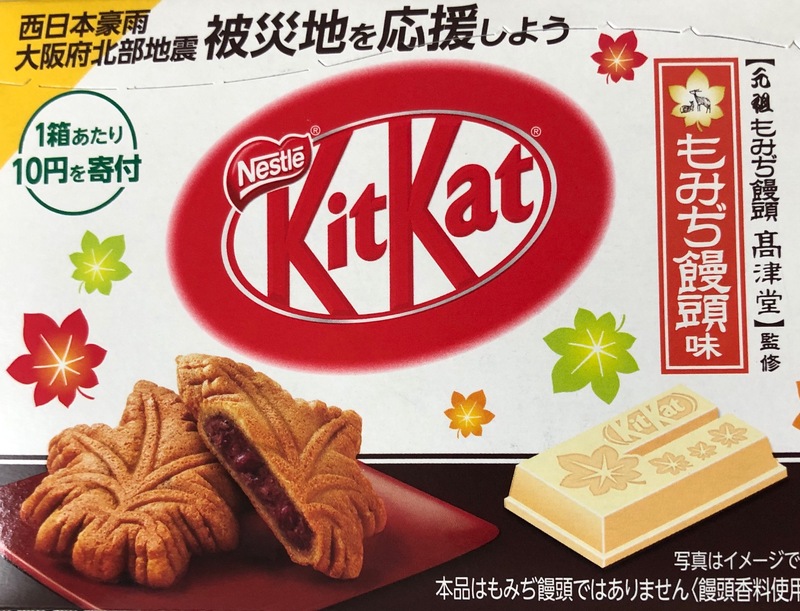 It's shaped like a beautiful Japanese maple leaf, a sweet cake comprised of buckwheat and rice and filled with sweet red bean paste. 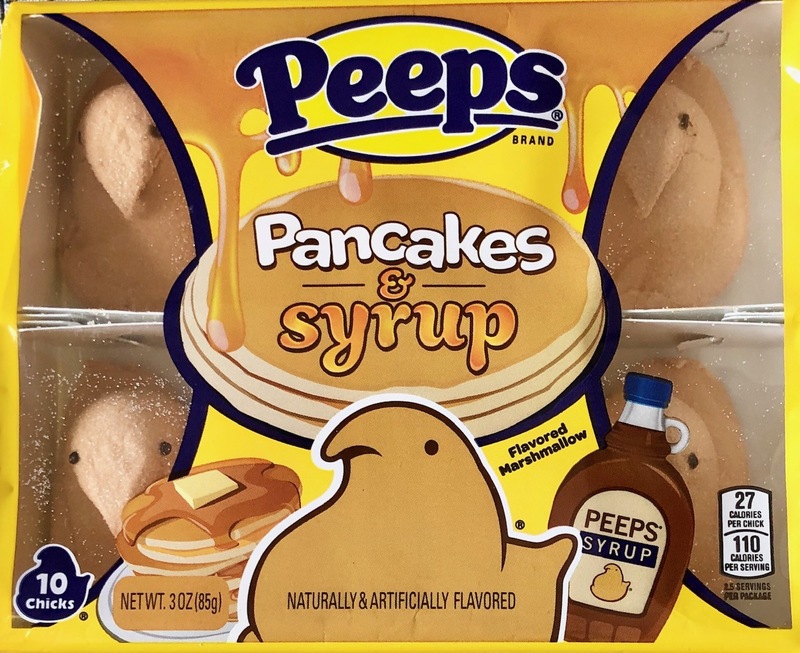 It sounds delicious and I'd love to try one. I'm not sure how reminiscent the candy bar is of the original sweet. 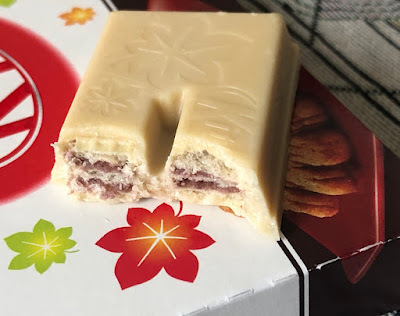 I could taste the flavor of red bean paste mixed in with the white chocolate, which was tasty, and would like to read a review from someone who is well-versed in traditional Mimiji Monju. 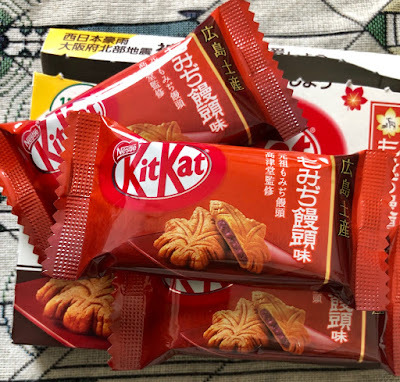 Fun to eat! 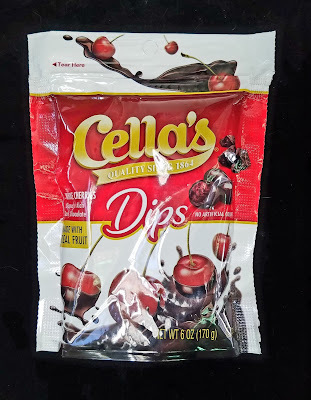 You know that utterly unique flavor of a classic Cella's chocolate covered cherry? (Since 1864!) 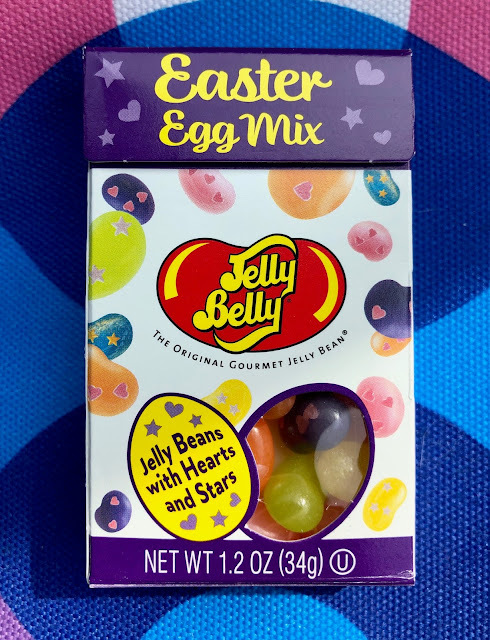 That amazingly thin yet sturdy outer dark chocolate shell, the candied chewy cherry at the center floating in that fantastic dripping cherry liquid. 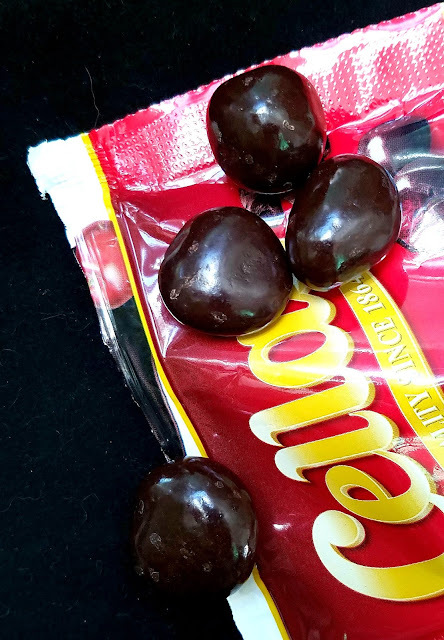 I've never tasted that flavor in any other chocolate covered cherry experience. Now Cella's has created a less messy version, Cella's Cherry Dips--basically the bonbon without the liquid. And yet that great cherry liquid flavor is infused into the candied cherry. I miss the pop of juice a bit, but this is still a great mouthful and far easier to carry around in one's bag. I love to try any new flavor variety of m&m's that are released into the market. 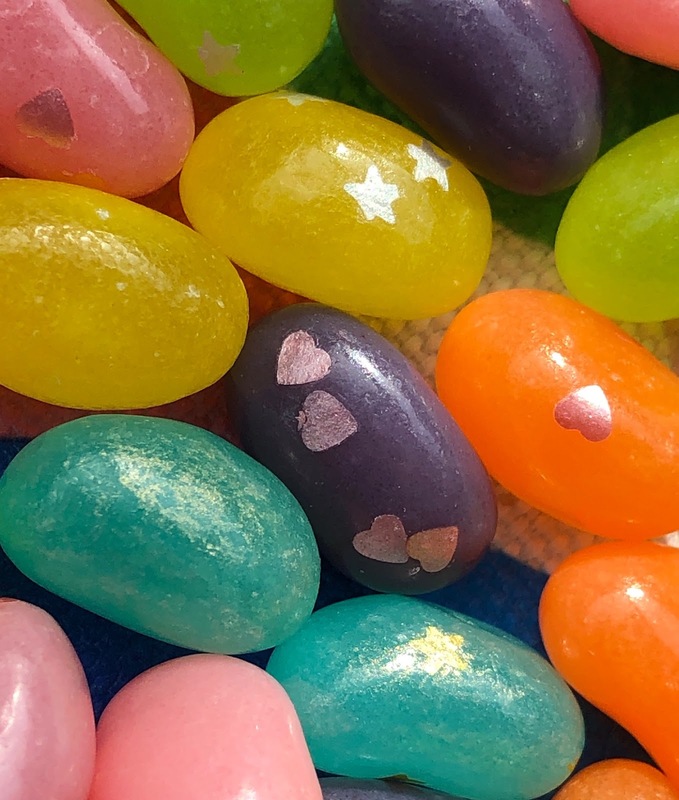 Especially ones with a beautiful color scheme--nothing uplifts the heart quite like a mix of candy in super-saturated and complimentary colors. These white chocolate marshmallow m&m's for Spring and/or Easter are such a tempting color mix, balancing a pale ballerina pink that verges on tan with vivid aqua, with flashes of startling white. 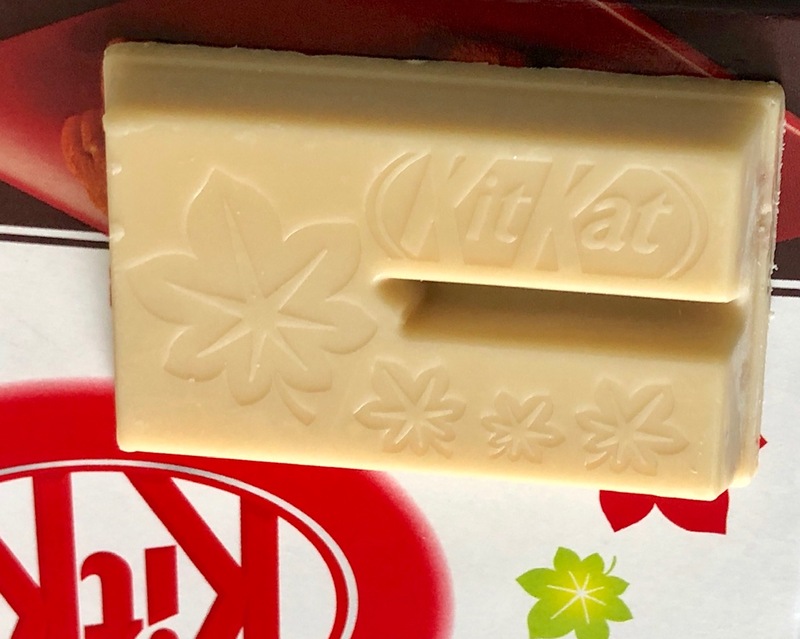 Unfortunately the marshmallow flavoring is simply drowned out by the super sweet white chocolate. 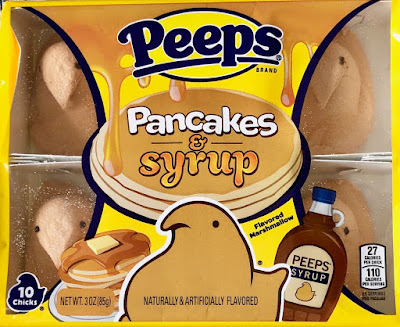 There's a bit of an essence of marshmallow but only if you're looking for it. 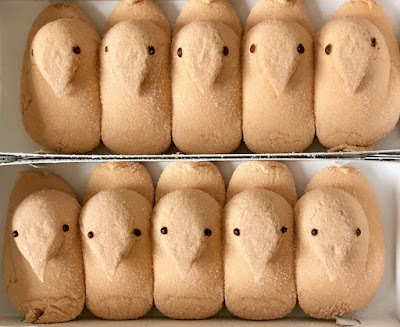 They're not bad, but they're basically White Chocolate m&m's in new colors of sugar shells. 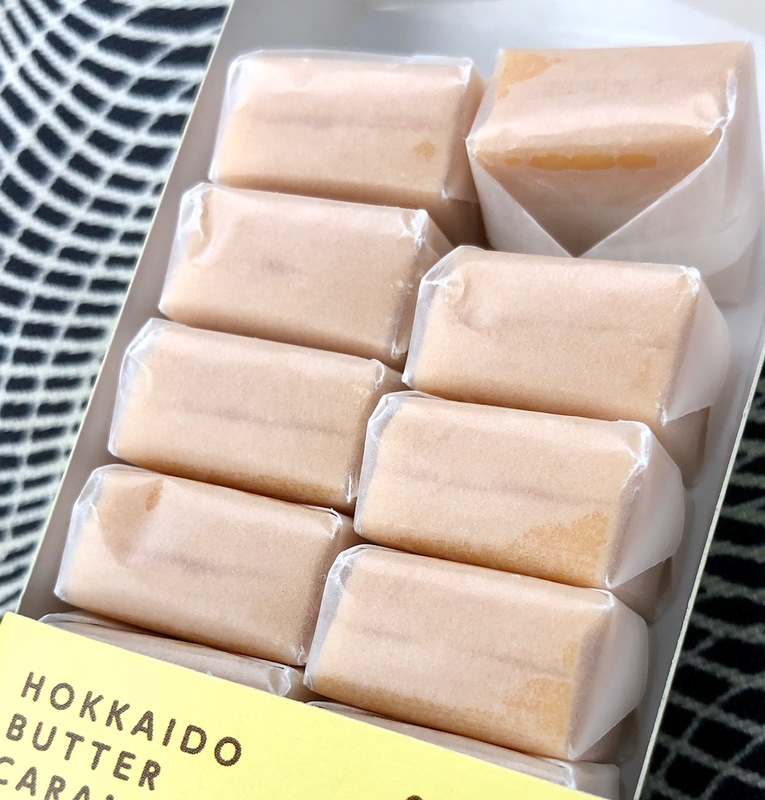 Really take a look at that mascot on the Donan Hokkaido Butter Caramel packaging. It's a pat of butter playing baseball! 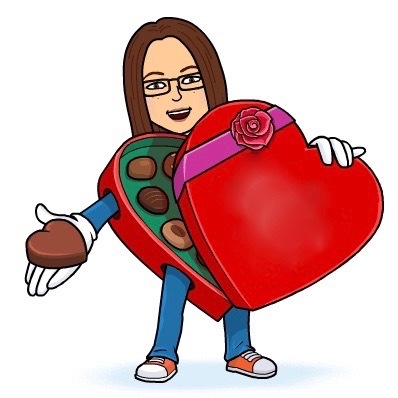 This is one of the most wonderful whimsical candy packages I've encountered, utterly charmed. The artificial butter flavor in these caramels, though, is way too much for my taste. The aroma hits your nose hard (hmm, like a pat of butter playing baseball...I see...) and the taste overwhelms the caramel. Not sumptuous buttery caramel, artificial vaguely floral butter flavoring. One was plenty for me. Americans need to hop on the honeycomb candy bandwagon. It's a brilliant creation, beloved in England, with so much untapped potential, and yet I only tend to find it at local chocolate stores that make their own. Let's look to Cadbury's classic Crunchie bar for an example. 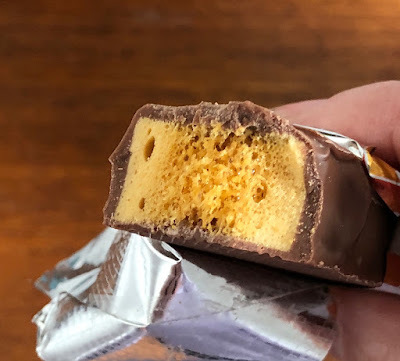 This isn't the fanciest honeycomb candy and yet it is a pure delight. 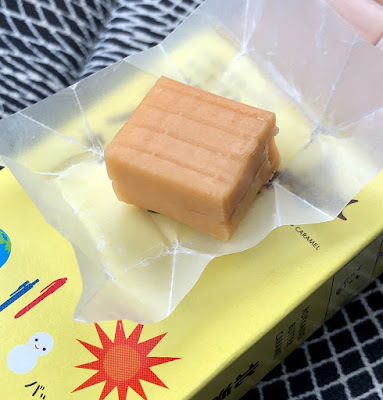 The way the sugar crystals break down with each bite is so pleasing, the flavor is rich and a bit more natural than your average candybar given the honey element. I love these Cadbury Crunchies. Here's my plea to an American candybar maker to please create a go-to American version! 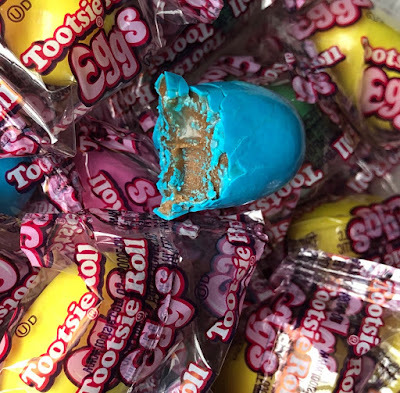 As far as I'm concerned, Tootsie Rolls are fine but nothing to seek out. After tasting these Tootsie Roll Eggs, though, I realize that what Tootsie Rolls were lacking was a Crunch. Add in this satisfying outer candy shell, and suddenly it's such a delicious mouthful of chew. 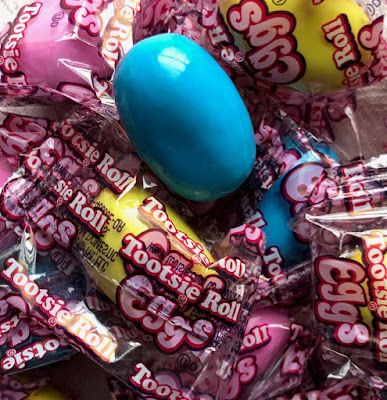 Tootsie Roll needs to issue some year-long variation on this theme!